Royal Stafford Fine Bone China Tea Set, Pattern #8171 - Made in England in the 1950's - Total of (14) Pieces. 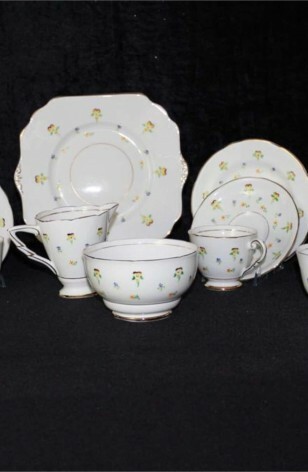 A great Pattern #8171, by Royal Stafford Fine China of England, is a charming casual patterned Tea Service consisting of (14) Pieces. A Service for Four (missing one saucer), would look great for all occasions. There is an overall Flower Pattern in Yellow/Orange/Blue with Green Leaves and Brown Hand Painted Accents. Scalloped with 22kt Gold Trim on Rims, Feet, Verges as well as Inside the Rim's of the Cups, Creamer and Sugar Bowl. 4 - Dessert/Tea/Fruit Plates - 6 5/8"